I loved this book. I bet the audiobook is awesome! Thanks for hosting and sharing such a great excerpt! Ceri, you have my email. Thanks for the giveaway opportunity. Hi Janet, I'm happy you enjoyed the book, and good luck with the giveaway! I've already won this audiobook and I'm listening to it. The book is great, and I love Stevie's French accent. Hi Kate, I'm glad you're enjoying it! Stevie does a great job. Glad to hear it's a good audio, KateB! A good narrator really helps the enjoyment of a story. Hi Eva, Audiobooks are good motivators. They definitely make driving more pleasant for me. Good luck with the giveaway! I could not walk and read a book at the same time! I don't think I can either! I used to do it sometimes when I was a child but I have more sense now and walk listening to audio. That being said, it's much the same as walking with your face buried in your phone, which is a common sight these days! I enjoyed reading the excerpt; now I'm off to Amazon to buy the book! Would love to hear the audio version. Hi Helen, I hope you enjoy the book and good luck with the giveawy! Glad you enjoyed the excerpt, Helen! Good luck in the giveaway. I enjoyed the excerpt and really love the premise. Sounds like a very action-packed story with them fleeing France together. Thanks for the giveaway, I believe you already have my contact info but if not, please let me know. I'm glad you find the story intriguing. Good luck with the giveaway! Hi Darcybennett, I have your info. Good luck in the giveaway! Hi Sophia, I'm happy to have you add this to your collection! Good luck with the giveaway. I absolutely LOVE this book!! I've read and re-read this book many times over the past few years!! I own the Kindle edition. I don't want to give away any spoilers, but I loved watching Darcy and Lizzy's admiration and love grow in France. There were so many plot twists and turns...that once I started reading this lovely, engaging novel, I couldn't put it down. LOVE it!!!! So glad you loved this one, Lisa! In case you didn't know, Victoria's latest book, The Unforgettable Mr Darcy, also takes the characters to France. I haven't read it yet, but I'm looking forward to it. 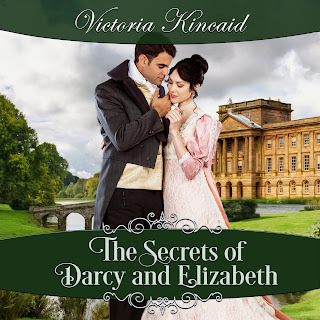 Good luck in winning the audio of The Secrets of Darcy and Elizabeth! Hi Lisa, Wow, you made my day! I'm so glad to know you enjoyed Secrets so much. Good luck with the giveaway. I was lucky enough to win a Kindle version of this when it was first published but hadn't realised it was Victoria's first book back then. It's amazing, as have been all of hers published since. Now I'm listening to the audio version on my commutes and, as Victoria says above, Stevie Zimmerman's performance is just wonderful! So glad you're enjoying the audio, Anji. It's great to learn that our dear couple is in a different country other than dear old familiar England. That will surely level the playing field and allow them to depend on each other. And it's also timely to that this audiobook is released at almost the same time when The Unforgettable Mr. Darcy is published. Both novels has France as the setting where the stories takes place. Thanks for the generous offer, Victoria. I have read and enjoyed this one very much - I would love to listen to the audio! I'm so glad many good books are being published in audio format as well. It is useful to fill some otherwise unused time like commuting or housework alone with listening to audiobooks. I completely agree, Agnes. Although I prefer to read with my eyes rather than my ears, I think many of us would like more reading time, and listening to audio books is a great way to make a little more time to read. I enjoyed reading this book and having listened to Stevie narrate other books, I know that she does a beautiful job. So glad to hear this praise of Stevie's narration. I haven't listened to a book that she has narrated yet. Thanks all for stopping by and commenting.